If a person takes alcohol profoundly for a very long period, then he/she acquires both physical and mental problems when they quit drinking or limit the intake quantity. This condition is known as alcohol withdrawal. Their body develops an increased tolerance to alcohol when they begin drinking. Ultimately, the body system demands more and more alcohol to hold the influence. The human body becomes subordinate to the alcohol, and a person must drink it regularly to avoid withdrawal symptom. 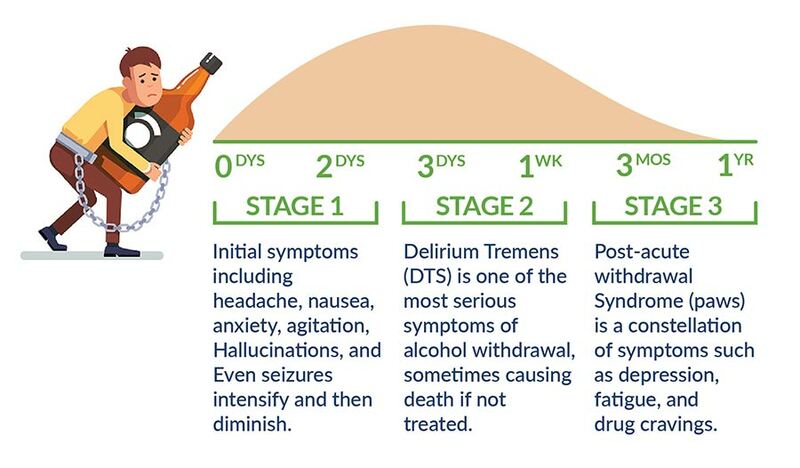 The symptoms of alcohol withdrawal; range from mild to severe. In extreme cases, they can be pretty intense and deadly. Due to its severity, the alcohol treatment must be supervised by an expert doctor. Usually, alcohol detox is recommended for the treatment of alcoholics. With the advancement in medical sciences, there are many effective treatments for alcohol addicts which can help them in quitting alcohol addiction and living a healthy life ahead. If the alcohol intake is once in a while, then there are fewer chances of developing alcohol withdrawal upon quitting. However, if you go through this condition once then, it can happen again when you call it quits. Now, moving towards the cause of alcohol withdrawal I’d like to explain to my reader why a person who is addicted to alcohol has to go through this when he/she tries to quit this unhealthy habit. Basically, on our body system alcohol has a depressive effect. It targets our brain function, slows it down and alternates the system of nerves transmission back and forth in the body. Eventually, the central nervous system of an alcoholic adjusts itself to run according to the alcohol effects all the time. The brain works hard to stay active and keep your nerves working. And, when the alcohol intake is dropped, then the brain system gets disturbed. This is the primary cause of withdrawal. The withdrawal symptoms depend upon several factors like how long you have been drinking, the frequency of drinking, medical history and how much you have been consuming. If the level of intake is average, then the addict faces mild symptoms otherwise if the consumption is high then the symptoms are severe and intense. After 12-24 hours, severe problems like hallucinations and seizures start happening. The person begins feeling, seeing or hears things which do not exist. This condition may last for two days. Due to an awful health condition, it is better to stay at the hospital or rehab center under medical expert’s supervision. Doctors will have regular check-ups and make sure that alcohol treatment is going on track. There are so many effective ways of alcohol treatment which aids an addicted person to overcome drinking no matter how serious it is. The rehab centers for alcohol treatments offer special services to those who are struggling with the battle of quitting the addiction. They have specialists who provide you guidance and support during the recovery time. The pain management is also dealt with care under experts. The first step towards alcohol treatment is detox. Alcohol detox helps in minimizing the effects of alcohol withdrawal on the body. Alcohol detox of the body can be started when the withdrawal symptoms start showing, and there is still alcohol inside the body. It gives you immense support to treat the withdrawal, but it is incredibly challenging. The symptoms could last for several weeks, and the condition gets worse in that period. But if you stick to an alcohol detox program, it will benefit your body for the long term. It involves medication for the symptoms or pain and other possible issues. The detox aims to get the patient stable physically and mentally. The patient is kept under intensive care and regular checkup. Considering your health and current situation, the doctors suggest the alcohol treatment program get rid of addiction permanently.